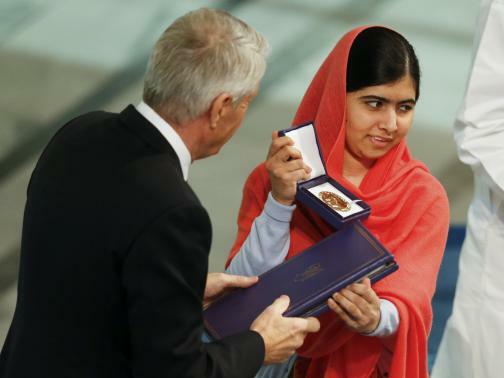 Nobel Peace Prize laureate Malala Yousafzai poses with the medal and the diploma during the Nobel Peace Prize awards ceremony at the City Hall in Oslo December 10, 2014. OSLO - Nobel Peace Prize laureate Malala Yousafzai said Wednesday she would continue her fight for education until every child was in school. 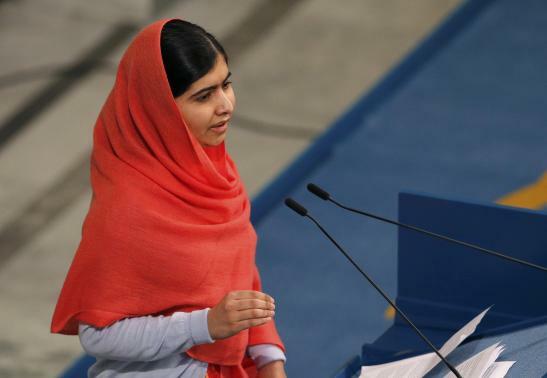 "I will continue this fight until I see every child in school," the 17-year-old Pakistani schoolgirl told an audience in Oslo City Hall after receiving the award. In a speech peppered with self-deprecating humour, the youngest ever Nobel recipient used the award ceremony to call not just for education but also fairness and peace. "The so-called world of adults may understand it, but we children don't. Why is it that countries which we call 'strong' are so powerful in creating wars but so weak in bringing peace?," she said in her speech. 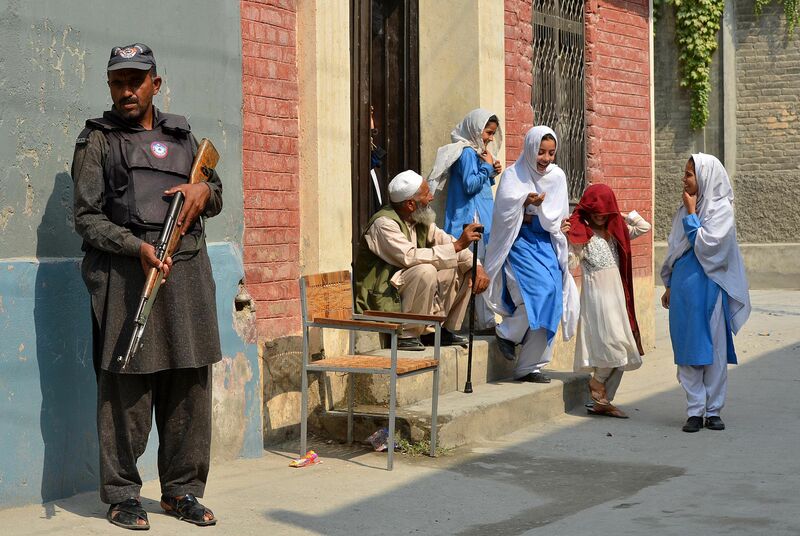 "Why is it that giving guns is so easy but giving books is so hard? Why is it that making tanks is so easy, but building schools is so difficult?" 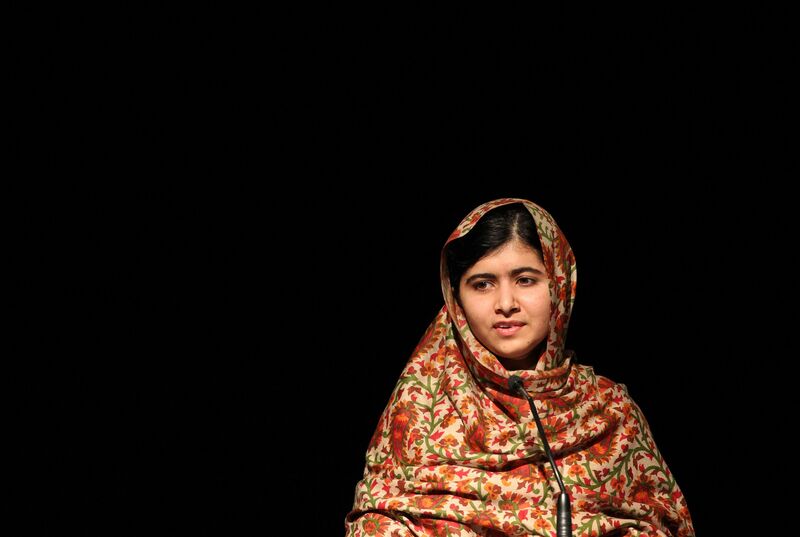 Malala, who described herself as the "first recipient of the Nobel Peace Prize who still fights with her younger brothers," triggered applause but also frequent outbursts of laughter during her speech. 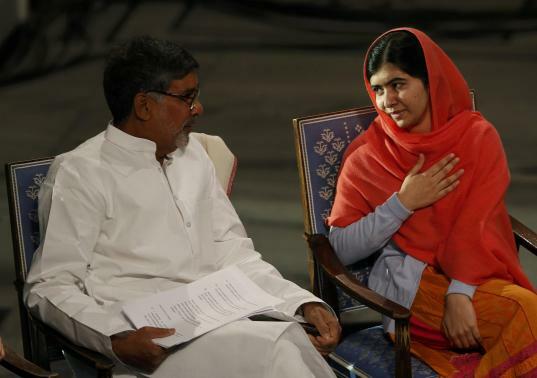 The young global icon, who was shot and nearly killed by the Taliban two years ago after she insisted on girls' rights to education, shared the prize with Indian child rights campaigner Kailash Satyarthi. Nobel Peace Prize laureate Malala Yousafzai receives the medal and the diploma during the Nobel Peace Prize awards ceremony. 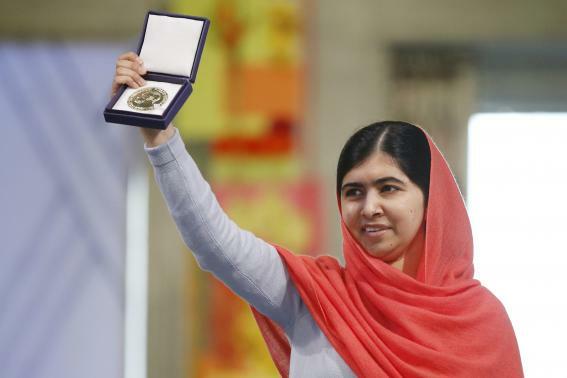 Nobel Peace Prize laureate Malala Yousafzai poses with her medal. Nobel Peace Prize laureates Malala Yousafzai (L) and Kailash Satyarthi arrive for the Nobel Peace Prize awards ceremony. 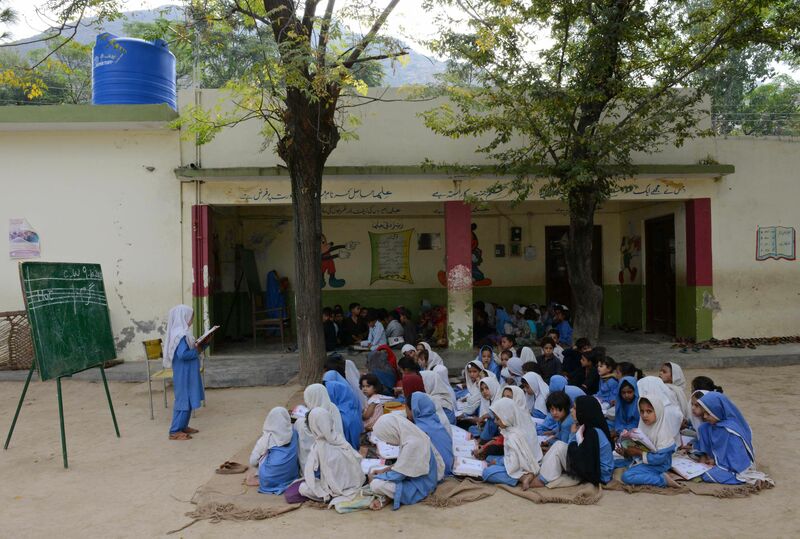 Two years ago, Yousafzai was traveling home from school in Mingora in the Swat Valley in northwest Pakistan when Taliban gunmen boarded her school bus and shot the 15-year-old in the head at point-blank range. 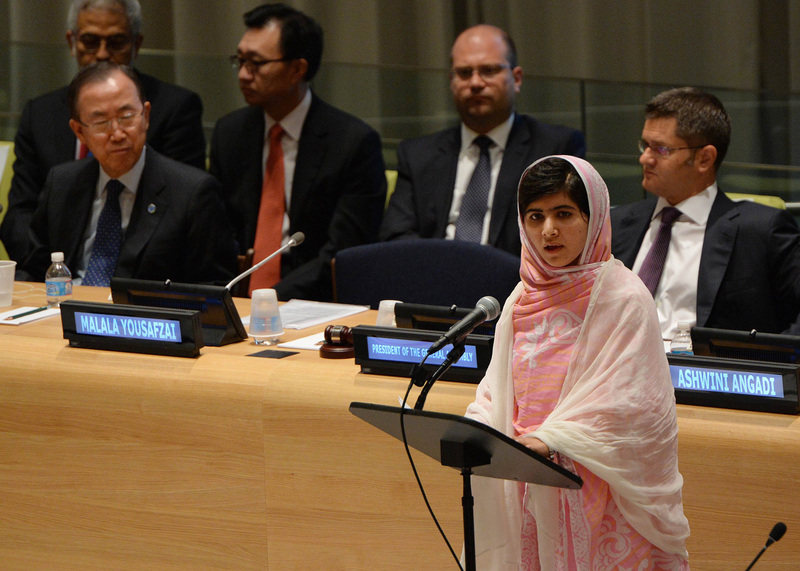 Nobel Peace Prize laureate Malala Yousafzai delivers her speech during the Nobel Peace Prize awards ceremony. 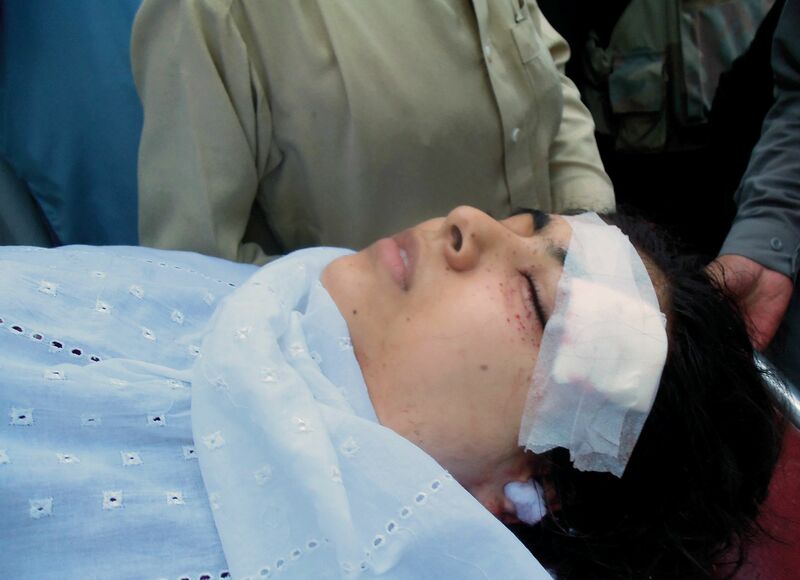 The attack was a punishment for her public campaigning from the age of 11 for the right for girls to go to school. 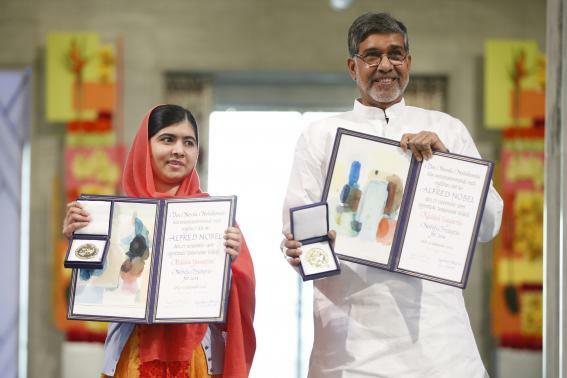 Nobel Peace Prize laureates Malala Yousafzai and Kailash Satyarthi at the Nobel Peace Prize awards ceremony at the City Hall in Oslo December 10, 2014. 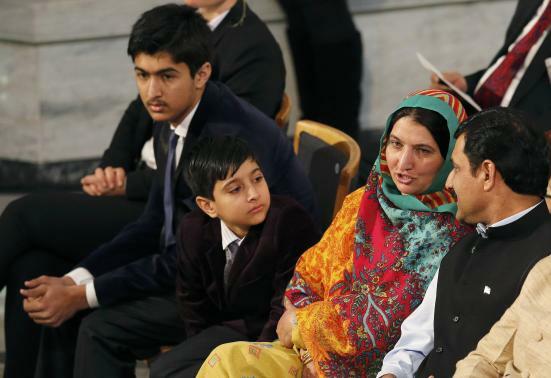 Family members of Nobel Peace Prize laureate Malala Yousafzai (not seen) attend the Nobel Peace Prize awards ceremony. Norway's Crown Princess Mette-Marit and Crown Prince Haakon arrive for the Nobel Peace Prize awards ceremony. 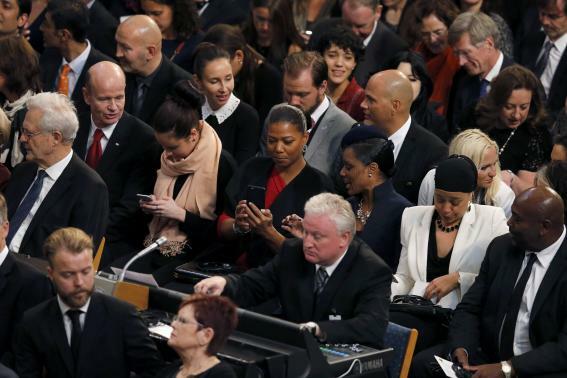 Dana Elaine Owens (C) better known by her stage name Queen Latifah attends the Nobel Peace Prize awards ceremony. 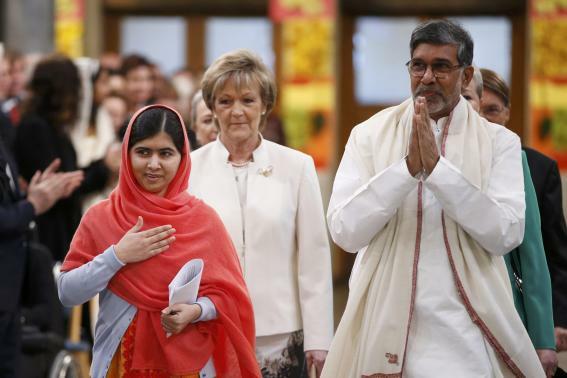 Nobel Peace Prize laureates Malala Yousafzai (R) and Kailash Satyarthi attend the Nobel Peace Prize awards ceremony. 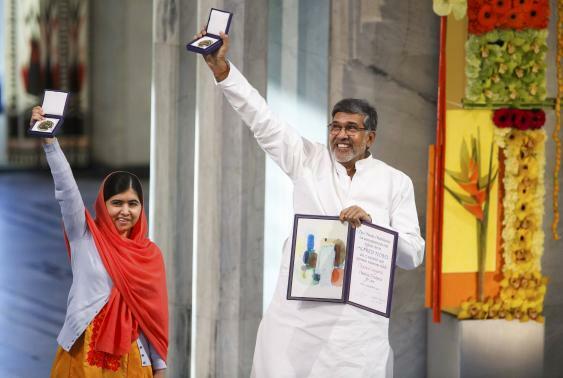 Nobel Peace Prize laureates Malala Yousafzai and Kailash Satyarthi (R) at the Nobel Peace Prize awards ceremony. 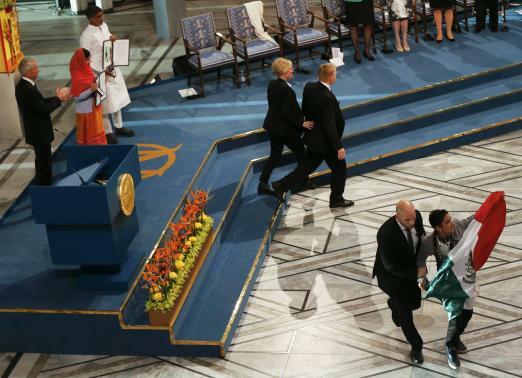 Nobel Peace Prize laureates Malala Yousafzai (top 2L) and Kailash Satyarthi (top R) pose with their medals as a security officer blocks a protester with the flag of Mexico. 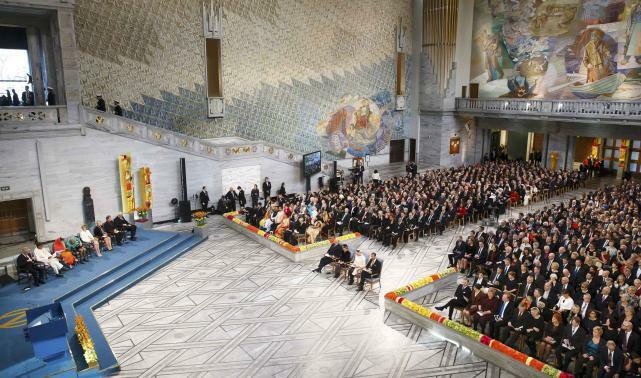 General view of the hall during the Nobel Peace Prize awards ceremony at the City Hall in Oslo December 10, 2014. 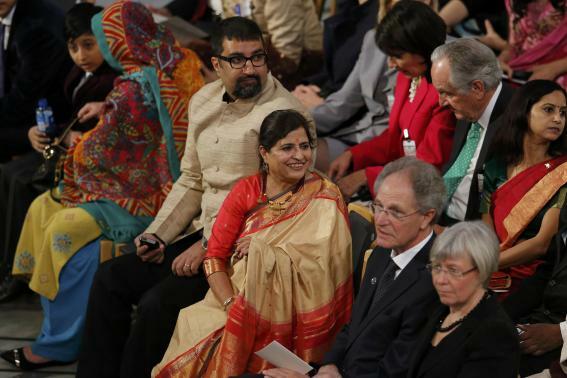 Sumedha (C), wife of Indian children right activist and 2014 Nobel peace prize laureate Kailash Satyarthi, and their son (3rd L) attend the awards ceremony. 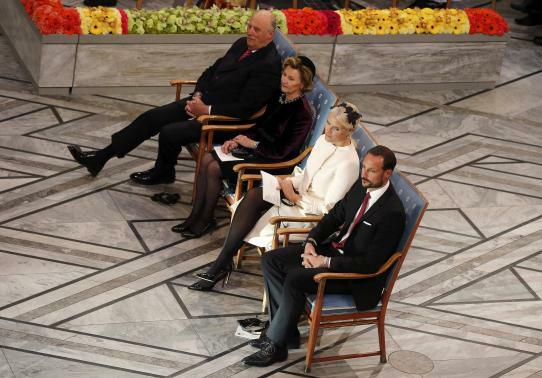 Norway's King Harald, his wife Queen Sonja, Crown Princess Mette-Marit and Crown Prince Haakon (L-R) attend the Nobel Peace Prize awards ceremony. 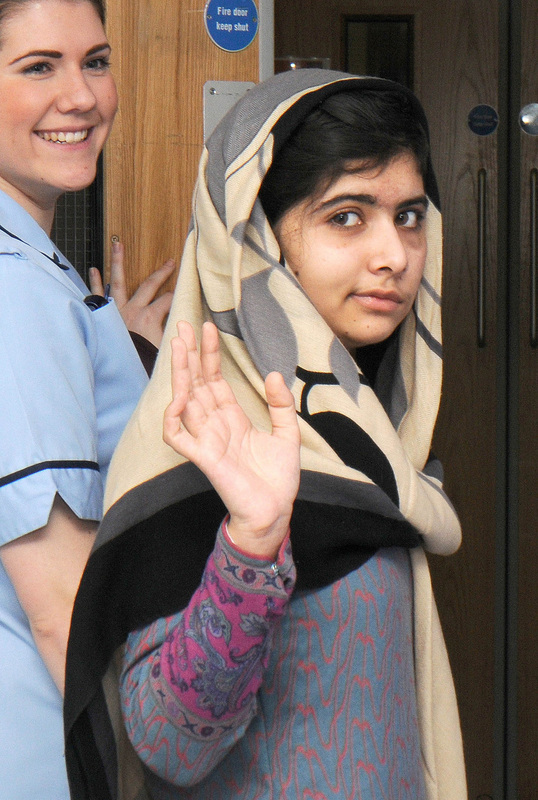 Malala Yousafzai's journey from Pakistani schoolgirl to Nobel Peace Prize winner has entranced the world as the teenager emerged defiant after a near-fatal attack by the Taliban to fight for girls' rights. 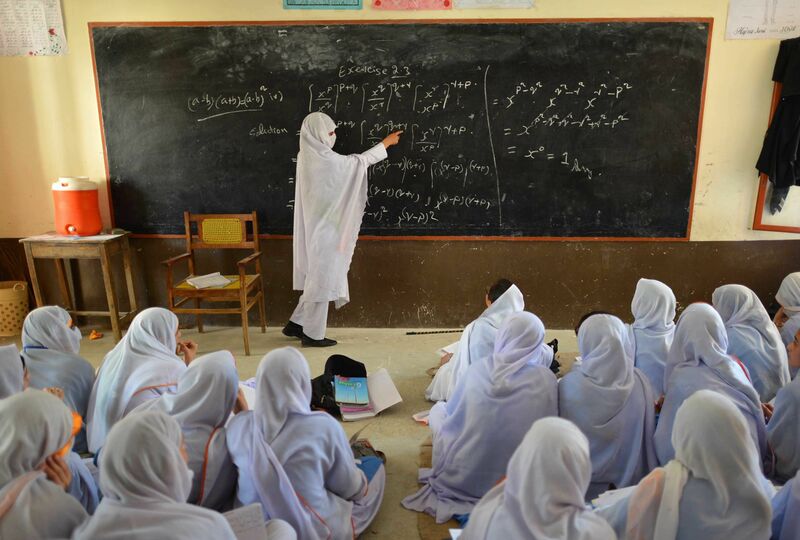 Yousafzai, now 17, and her father Ziauddin Yousafzai, a school principal and education activist, had become well-known in Pakistan for their campaign and refused to be silenced despite repeated threats from the Taliban. Fighting for her life, Yousafzai was treated in Pakistan before the United Arab Emirates provided an air ambulance to fly her to Britain where doctors repaired her skull with a titanium plate and operated to help restore lost hearing. 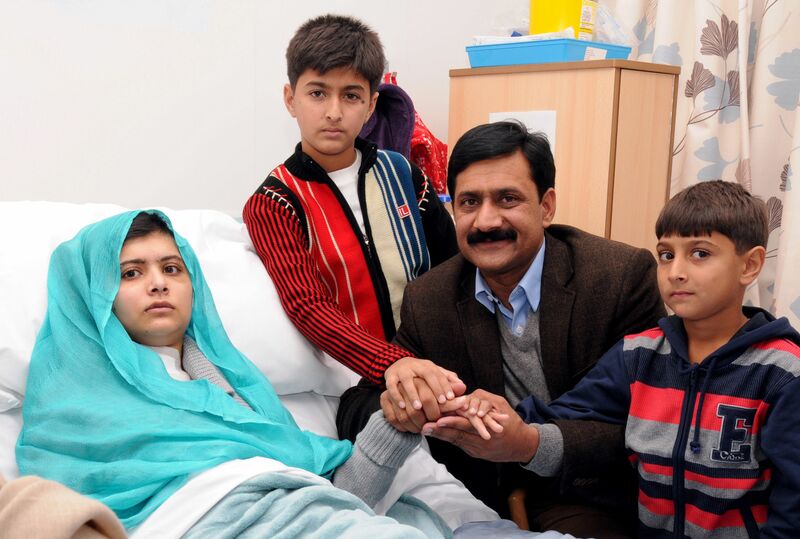 Following a remarkable recovery, she was unable to return to Pakistan due to continuing Taliban threats so set up a new life with her parents and two younger brothers in Birmingham in central England. 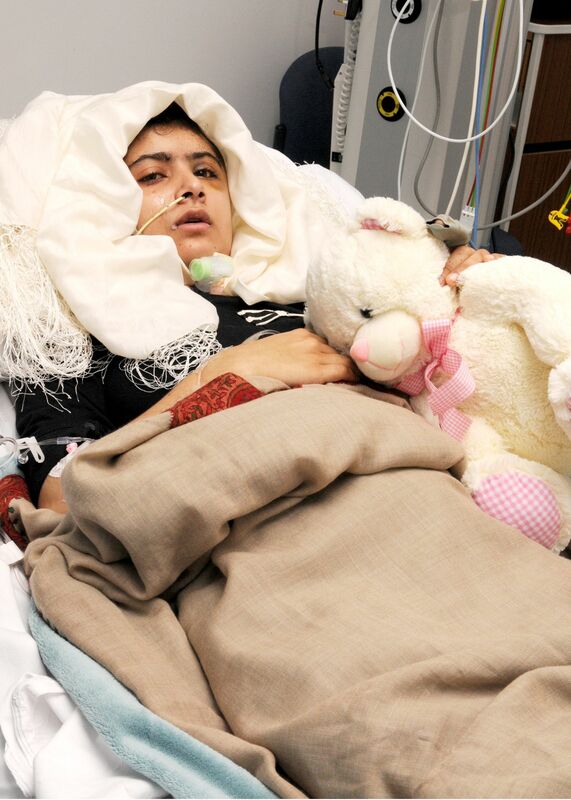 But perhaps more miraculous than her recovery is the journey that has seen her emerge from being the victim of a failed murder attempt to a global figurehead for peaceful protest and for the right of every child to go to school. Yousafzai herself has expressed surprise at where the past two years have led her, but she remains committed to continue her fight. "You are helping me to bring awareness to the world of my cause, to which I have dedicated myself. 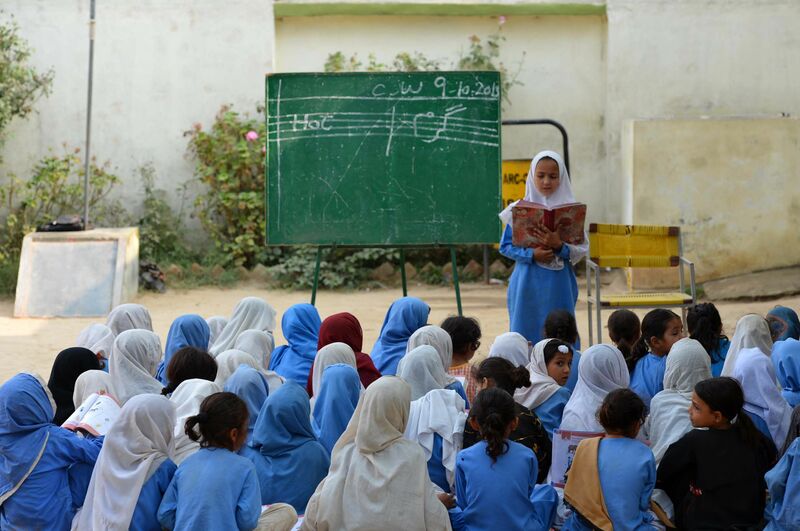 Nothing is more important for me than the right of every child to be educated," she once told an award ceremony. "I don't know why, but hearing I was being targeted did not worry me. It seemed to me that everyone knows they will die one day," wrote Malala in a memoir "I Am Malala: The Girl Who Stood Up for Education and was Shot by the Taliban". 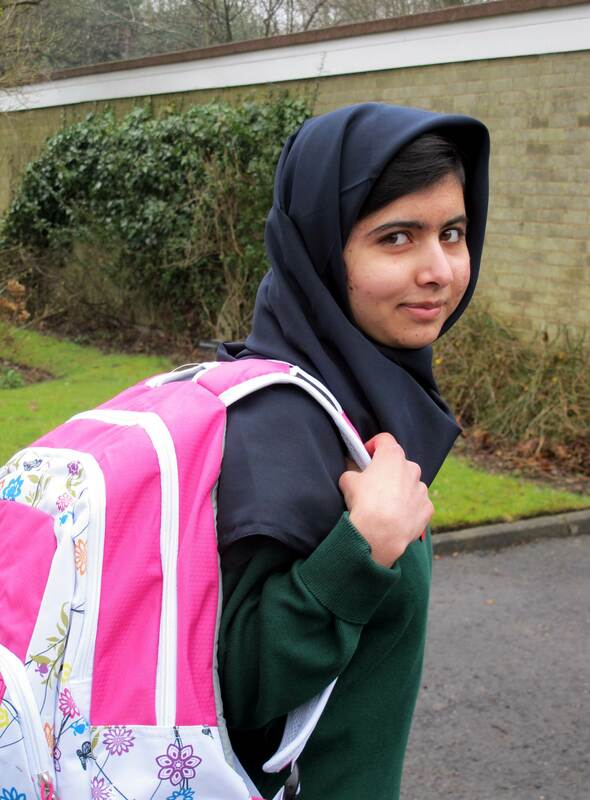 The West has lauded Yousafzai for her bravery, with her legions of fans including Hollywood actress Angelina Jolie, a donor to The Malala Fund set up by the teenager and her family to help educate girls in Pakistan and around the world. 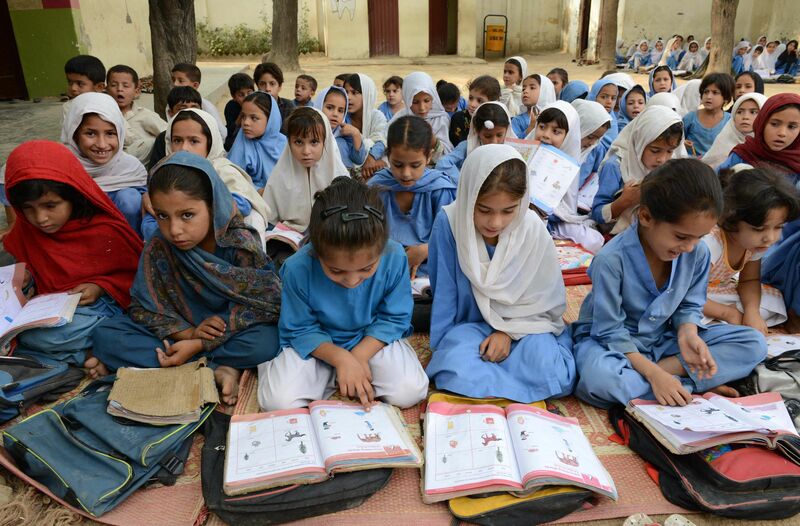 UNESCO figures show almost 58 million primary age children globally do not attend school. 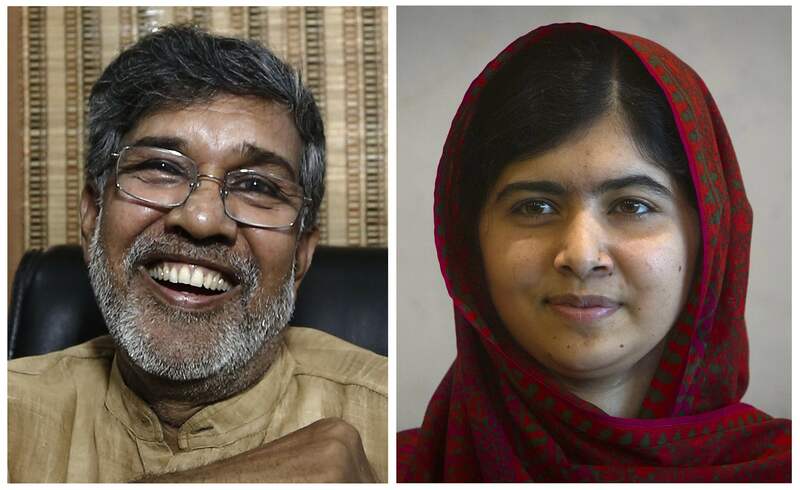 This year's Nobel Peace Prize winners: Indian children's right activist Kailash Satyarthi (L) and Pakistani schoolgirl activist Malala Yousafzai.